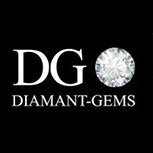 Colour assessment is critical in estimating a stone, and explains the difference in price from one diamond to another. Generally speaking, diamond colours vary from yellowish to bluish white ; other colours are called fancy colours. Blue, green, yellow (but only when it is canary yellow), and brown (when it is intense), can all be distinguished. Light brown or champagne tones have a lower value, and their price varies according to demand. Pink is highly sought after ; it is usually very pale but when it is a deep pink, its value is inestimable. Brown and yellowish diamonds are the least popular. Those of particularly bad quality are used primarily in industry. Unambiguously determining diamond colour, while being as objective as possible, has always been a necessary procedure in the diamond trade. To get a first indication of the diamond’s colour, place it on a sheet of pure white cardboard, folded in the middle with the culet of the stone pointing upwards, as it is in this part that the colour is most apparent. The examination is performed by bringing the cardboard as close as possible to a cold white light source, eliminating all other external light sources. It can also be done in daylight, facing north (never in sunlight), on a clear day. An ancient procedure was to breathe on the diamond : it was found that the colours were revealed more easily as the condensation disappeared.